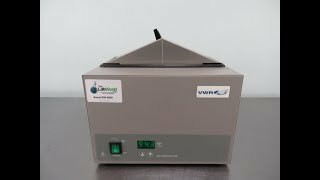 The VWR Digital Waterbath 1215PC provides precise digital control for a wide variety of laboratory applications. This 2-liter laboratory water bath has a seamless, corrosion resistant interior for use with distilled water and sturdy powder coated steel construction that’s resistant to chipping or scratching. This lab waterbath has a gabled stainless lid, designed to channel condensation away from the immersed vessel and back into the bath. The temperature on this microprocessor controlled lab bath is variable, set from upfront digital panel with touch keypad, within a range of 5 above ambient to 100°C. This laboratory water bath also has an over temperature control to prevent thermal runaway or damage from accidentally running while empty. This VWR Digital Waterbath 1215PC has been fully inspected and reached its temperature without issue. All of our lab equipment comes backed with our standard warranty. Should you have any questions, please don't hesitate to contact us.